Transcription factor 7-like 2 (T-cell specific, HMG-box) also known as TCF7L2 or TCF4 is a protein acting as a transcription factor. In humans this protein is encoded by the TCF7L2 gene. The single nucleotide polymorphism (SNP) within the TCF7L2 gene, rs7903146, is, to date, the most significant genetic marker associated with Type 2 diabetes mellitus (T2DM) risk. SNPs in this gene are linked to higher risk to develop type 2 diabetes, as well as gestational diabetes. 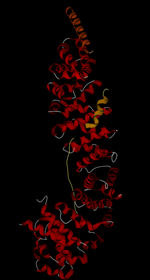 Structure of complex between TCF7L2 (orange), β-catenin (red), and BCL9 (brown). TCF7L2 is a transcription factor influencing the transcription of several genes thereby exerting a large variety of functions within the cell. It is a member of the Wnt signaling pathway. Stimulation of the pathway leads to the association of β-catenin with BCL9, translocation to the nucleus, and association with TCF7L2, which in turn results in the activation of Wnt target genes, specifically repressing proglucagon synthesis in enteroendocrine cells. TCF7L2 is implicated in a large variety of diseases. Several single nucleotide polymorphisms are associated with type 2 diabetes. In European populations it was found to be a major determinant of type 2 risk. A frameshift mutation of TCF7L2 is implicated in colorectal cancer. Variants of the gene are most likely involved in many other cancer types. While TCF4 is sometimes misleadingly used as an alias symbol for TCF7L2, it is also the symbol officially approved by the HUGO Gene Nomenclature Committee for the transcription factor 4 gene. ↑ "Diseases that are genetically associated with TCF7L2 view/edit references on wikidata". ↑ Castrop J, van Norren K, Clevers H (1992). "A gene family of HMG-box transcription factors with homology to TCF-1". Nucleic Acids Res. 20 (3): 611. doi:10.1093/nar/20.3.611. PMC 310434 . PMID 1741298. ↑ Vaquero AR, Ferreira NE, Omae SV, Rodrigues MV, Teixeira SK, Krieger JE, Pereira AC (2012). "Using gene-network landscape to dissect genotype effects of TCF7L2 genetic variant on diabetes and cardiovascular risk". Physiol. Genomics. 44 (19): 903–14. doi:10.1152/physiolgenomics.00030.2012. PMID 22872755. 1 2 3 Jin T, Liu L (2008). "The Wnt signaling pathway effector TCF7L2 and type 2 diabetes mellitus". Mol. Endocrinol. 22 (11): 2383–92. doi:10.1210/me.2008-0135. PMID 18599616. ↑ Zhang C, Bao W, Rong Y, Yang H, Bowers K, Yeung E, Kiely M (2013). "Genetic variants and the risk of gestational diabetes mellitus: a systematic review". Hum. Reprod. Update. 19 (4): 376–90. doi:10.1093/humupd/dmt013. PMID 23690305. ↑ PDB: 2GL7​; Sampietro J, Dahlberg CL, Cho US, Hinds TR, Kimelman D, Xu W (October 2006). "Crystal structure of a beta-catenin/BCL9/Tcf4 complex". Mol. Cell. 24 (2): 293–300. doi:10.1016/j.molcel.2006.09.001. PMID 17052462. ↑ Lee JM, Dedhar S, Kalluri R, Thompson EW (2006). "The epithelial-mesenchymal transition: new insights in signaling, development, and disease". J. Cell Biol. 172 (7): 973–81. doi:10.1083/jcb.200601018. PMC 2063755 . PMID 16567498. ↑ Slattery ML, Folsom AR, Wolff R, Herrick J, Caan BJ, Potter JD (2008). "Transcription factor 7-like 2 polymorphism and colon cancer". Cancer Epidemiol. Biomarkers Prev. 17 (4): 978–82. doi:10.1158/1055-9965.EPI-07-2687. PMC 2587179 . PMID 18398040. ↑ Hazra A, Fuchs CS, Chan AT, Giovannucci EL, Hunter DJ (2008). "Association of the TCF7L2 polymorphism with colorectal cancer and adenoma risk". Cancer Causes Control. 19 (9): 975–80. doi:10.1007/s10552-008-9164-3. PMC 2719293 . PMID 18478343. ↑ Tang W, Dodge M, Gundapaneni D, Michnoff C, Roth M, Lum L (2008). "A genome-wide RNAi screen for Wnt/beta-catenin pathway components identifies unexpected roles for TCF transcription factors in cancer". Proc. Natl. Acad. Sci. U.S.A. 105 (28): 9697–702. Bibcode:2008PNAS..105.9697T. doi:10.1073/pnas.0804709105. PMC 2453074 . PMID 18621708. Segditsas S, Tomlinson I (2006). "Colorectal cancer and genetic alterations in the Wnt pathway". Oncogene. 25 (57): 7531–7. doi:10.1038/sj.onc.1210059. PMID 17143297. Florez JC (2007). "The new type 2 diabetes gene TCF7L2". Curr Opin Clin Nutr Metab Care. 10 (4): 391–6. doi:10.1097/MCO.0b013e3281e2c9be. PMID 17563454. Castrop J, van Norren K, Clevers H (1992). "A gene family of HMG-box transcription factors with homology to TCF-1". Nucleic Acids Res. 20 (3): 611. doi:10.1093/nar/20.3.611. PMC 310434 . PMID 1741298. Korinek V, et al. (1997). "Constitutive transcriptional activation by a beta-catenin-Tcf complex in APC-/- colon carcinoma". Science. 275 (5307): 1784–7. doi:10.1126/science.275.5307.1784. PMID 9065401. Suzuki Y, et al. (1997). "Construction and characterization of a full length-enriched and a 5'-end-enriched cDNA library". Gene. 200 (1-2): 149–56. doi:10.1016/S0378-1119(97)00411-3. PMID 9373149. He TC, et al. (1998). "Identification of c-MYC as a target of the APC pathway". Science. 281 (5382): 1509–12. Bibcode:1998Sci...281.1509H. doi:10.1126/science.281.5382.1509. PMID 9727977. Barker N, Huls G, Korinek V, Clevers H (1999). "Restricted high level expression of Tcf-4 protein in intestinal and mammary gland epithelium". Am. J. Pathol. 154 (1): 29–35. doi:10.1016/S0002-9440(10)65247-9. PMC 1853446 . PMID 9916915. Omer CA, Miller PJ, Diehl RE, Kral AM (1999). "Identification of Tcf4 residues involved in high-affinity beta-catenin binding". Biochem. Biophys. Res. Commun. 256 (3): 584–90. doi:10.1006/bbrc.1999.0379. PMID 10080941. Giannini AL, Vivanco MM, Kypta RM (2000). "Analysis of beta-catenin aggregation and localization using GFP fusion proteins: nuclear import of alpha-catenin by the beta-catenin/Tcf complex". Exp. Cell Res. 255 (2): 207–20. doi:10.1006/excr.1999.4785. PMID 10694436. Duval A, Busson-Leconiat M, Berger R, Hamelin R (2000). "Assignment of the TCF-4 gene (TCF7L2) to human chromosome band 10q25.3". Cytogenet. Cell Genet. 88 (3-4): 264–5. doi:10.1159/000015534. PMID 10828605. Duval A, et al. (2000). "The human T-cell transcription factor-4 gene: structure, extensive characterization of alternative splicings, and mutational analysis in colorectal cancer cell lines". Cancer Res. 60 (14): 3872–9. PMID 10919662. Brantjes H, Roose J, van De Wetering M, Clevers H (2001). "All Tcf HMG box transcription factors interact with Groucho-related co-repressors". Nucleic Acids Res. 29 (7): 1410–9. doi:10.1093/nar/29.7.1410. PMC 31284 . PMID 11266540. Palacino JJ, et al. (2001). "Presenilin 1 regulates beta-catenin-mediated transcription in a glycogen synthase kinase-3-independent fashion". J. Biol. Chem. 276 (42): 38563–9. doi:10.1074/jbc.M105376200. PMID 11504726. Miravet S, et al. (2002). "The transcriptional factor Tcf-4 contains different binding sites for beta-catenin and plakoglobin". J. Biol. Chem. 277 (3): 1884–91. doi:10.1074/jbc.M110248200. PMID 11711551. Graham TA, et al. (2001). "Tcf4 can specifically recognize beta-catenin using alternative conformations". Nat. Struct. Biol. 8 (12): 1048–52. doi:10.1038/nsb718. PMID 11713475. Poy F, Lepourcelet M, Shivdasani RA, Eck MJ (2001). "Structure of a human Tcf4-beta-catenin complex". Nat. Struct. Biol. 8 (12): 1053–7. doi:10.1038/nsb720. PMID 11713476. Thiele A, et al. (2001). "Regulation and possible function of beta-catenin in human monocytes". J. Immunol. 167 (12): 6786–93. doi:10.4049/jimmunol.167.12.6786. PMID 11739494. Marchenko GN, Marchenko ND, Leng J, Strongin AY (2002). "Promoter characterization of the novel human matrix metalloproteinase-26 gene: regulation by the T-cell factor-4 implies specific expression of the gene in cancer cells of epithelial origin". Biochem. J. 363 (Pt 2): 253–62. doi:10.1042/0264-6021:3630253. PMC 1222473 . PMID 11931652. Leung JY, et al. (2002). "Activation of AXIN2 expression by beta-catenin-T cell factor. A feedback repressor pathway regulating Wnt signaling". J. Biol. Chem. 277 (24): 21657–65. doi:10.1074/jbc.M200139200. PMID 11940574.